The New Gene Larew 4.25" Rattlin' Crawler is the Ultimate Craw/Creature Bait! This Rattlin' Crawler comes with a quality one-ball glass rattle already inserted into the hollow body chamber so all you have to do is open a pack and fish! 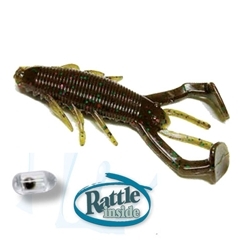 The Gene Larew Rattlin' Crawler has a hollow body chamber to amplify the quality glass rattle on the inside. This bait has oversized kick-pads that deliver crazy thumping action! The Rattlin' Crawler can be used on Gene Larew Hard Heads, as a jig trailer, or by itself! 6 count packs.